With the drive of the Ape Men, but without the double picking or speed. The sound is lo-fi, but much of the music is worth seeking out. 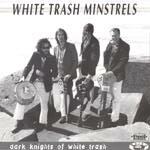 The White Trash Minstrels are from The Hague. Riff rockin' surf trash, speedy and suave, with great drums and a catchy riff. It's a wild ride on the crest of a messy wall about to crash on the rocks. Chorded and melodic, this is a solid adventure in aquatic visions. Not exactly surf, but with some really nice moments, and amply loud. Duke Ellington's "Caravan" is given a trashy organ bed that dominates this loungie surf exploration. It's cute, but not particularly durable. Dramatic, slightly Italian, over reverbed, and moody. "Guantita" has a distant and dangerous feel, and maybe a bit of the spy theme about it. The classic "Besame Mucho" is delivered in a non threatening almost bland arrangement. It doesn't demand attention or stay in RAM very long after playing. This is a nicely written piece, with a sad melody in a slightly Italian vein. While pretty, it's also just a little dangerous, like a Mafia love theme. Prancy organ and guitar go-go stuff... fun but unmemorably jam oriented. In the lore of the sea, the "Bermuda Triangle" is where you take your boat to lose it... this is slightly sad and a little playful, but not at all mysterious or of the lost at sea variety. past the title mismatch, it's a pleasant softly delivered number with appeal and warmth. This is tasty Italian/Mexican inspired piece with fine vibrato and a picturesque melody. Probably the best track here, "Fistfull Of Pesos" displays rumble and power in a mid tempo format. Shimmering and a little ominous. Low-E reverb gangster surf with a Morricone feel and a cool arrangement. A little chord heavy, but gutsy and awash in reverb and vibrato. It's maybe a blend of the Treble Spankers and the Ape Men in a lo-fi environment.